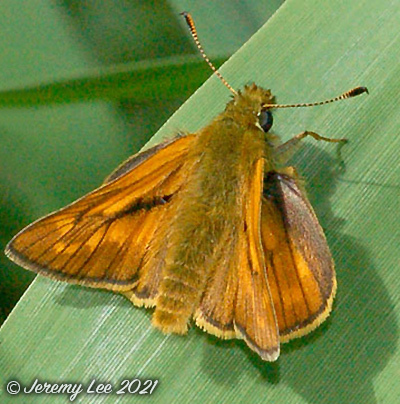 Ochlodes venata is more commonly known as the Large Skipper; although called 'Large' this is still a relatively small butterfly and not much larger than either the Small or Essex Skippers. The faint chequered pattern on both the upperside and underside help to distinguish the Large Skipper from these two orange Skippers. It can be found anywhere where wild grasses are allowed to grow tall. Hedgerows, woodland clearings and edges are favourites. An active little butterfly in sunny weather it is attracted to various flowers but has a distinct liking for Bramble flowers. Eggs are laid singly on the underside of foodplant leaves and hatch after about two weeks. Pupation lasts about three weeks during May and June and the adults are present from June to August. It is the first of the 'grass skippers' to emerge in the UK.